The inspirational athlete profiles are my least favorite part of the Olympics. “Take a moment to appreciate your accomplishments” generally seems like a waste of time to me. 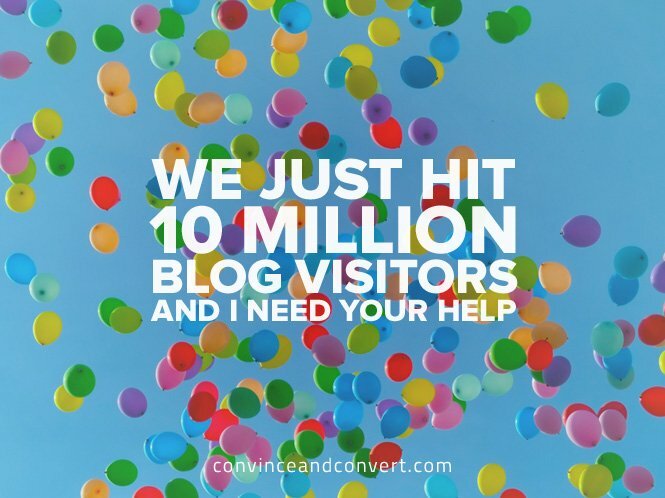 Yesterday, Convince & Convert was visited for the 10 MILLIONTH time! The blog that I started it my home office in 2008 with me writing every post has now been visited by an audience the equivalent size of Portugal. It is woefully insufficient, but all I can really say is “thank you.” There are a LOT of blogs out there, and a LOT of blogs that cover topics similar to what we do here at Convince & Convert. So for anyone to pick us is an absolute honor, and for that to happen 10 million times? I can’t even. And a huge thank you to our incredible editorial team and our extraordinary content contributors. Without you, there is no ConvinceAndConvert.com. Please know that our entire team recognizes what a privilege it is to do what we do, and we’ll never take your trust for granted. Our goal is simple, yet difficult: to be the most useful source for online marketing and customer service advice and counsel. Thank you for letting us try to meet that test. But the only way we can meet that goal is to get more and more (and more) relevant, and to provide you exactly what you need to know. I can’t do that without information. Please, please, please take just a moment to complete the survey below. (you might even win a cool prize from our Vault of Awesome). We’ll use your responses to help guide our content plan, our podcast plan, our email plan, and more.